National Fisheries Solidarity Movement (NAFSO) will lead this time to celebrate the World Fisheries Day with the puttalam district partner organanization, Puttalam "District Fisheries Solidarity". 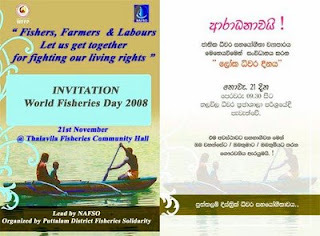 Thousands of fishers, farmers and labours will gather to celebrate this day as it their own day on 21 November 2008. Puttalam District Fisheries Solidarity have been planning to held this programme at Fisheries Community hall in Thalavila beach. before beginning an event all people will march around two Killo meeters with vast posters and banners demanding their living rights.